Woburn residents and members of St. John’s Baptist Church enjoyed an inspirational Dr. Martin Luther King Jr. Scholarship Luncheon Monday at the Hilton Hotel. Rev. Pearson of St. John’s opened by emphasizing the importance of cultivating a diverse network of friends as a first step to honoring Dr. King’s legacy. Woburn Mayor Scott Galvin and Superintendent Mark Donovan were among the Woburn officials on hand to honor Dr. King’s legacy and the award recipients. 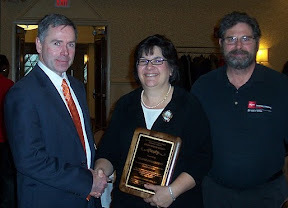 Elaine Dougherty received a Community Drum Major Award to recognize her work with the YMCA International Learning Center in Woburn. MLK scholarships were presented to four graduating seniors. I'm looking forward to speaking tomorrow at the annual meeting of the Greater Plymouth Council of Human Service Agencies & their Brockton counterparts. The theme of the talk is "The Year Ahead: Translating Hope into Action". I'll be developing 4 reasons for the nonprofit sector to be hopeful in 2010, and what we need to do to translate that hope into action. I'll blog more on this theme a bit later, but for now I wanted to get this posted in part as an environmentally friendly way of sharing the presentation with the audience. But also hoping that others coming across this online will be able to get some of the key points from the talk. Here is the link to the presentation I'm sharing with the audience. A year-end donation to SCI right now can make a big difference. We’re trying to raise the final $1365 we need to reach our fundraising goal for the year, and donations made to help us reach the goal will be matched by our Board chair. Like most organizations these days, we’ve had to implement reductions to our already lean budget. We’re leaving a vacant position open, thus just 4 professional staff managing our community-building programs across 10 locations. This is possible with 18 strong AmeriCorps members, hundreds of volunteers and great community partners; but we need your help to reach our fundraising goal to maintain this level of programming. You can help connect people to the resources they need at this time when budgets are stretched thin and every dollar counts. Every week, SCI connects over 5,700 residents in Dorchester, Lynn and Woburn with timely information they need to participate in community life and vital resources that can help in these tight times. This week we're connecting people to a flu clinic in Dorchester; last week we recruited a volunteer to teach developmentally disabled adults how to skate; throughout the fall we've mobilized hundreds of food, clothing and toy donations as people respond to the needs they learn about through SCI. Looking to sink your teeth into something more than candy this Halloween? Here are 3 ways you can help Boston area communities on Saturday.